Arthur James Wetherall Burgess (1879-1957). Oil painting on board and signed Arthur J Burgess (LR). 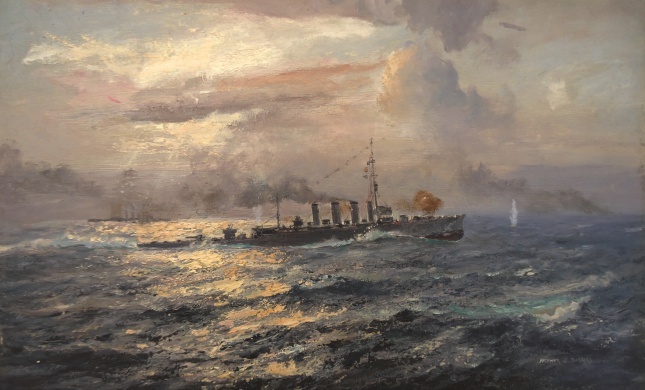 This fine oil painting by Burgess - a master of accurate ship draftmanship and especially admired for his skilful ability to portray dappled light on seas - is signed but not titled and so some detective work has been required! It is a WW1 action and the subject of the picture is either HMS CHESTER or her sister ship, HMS BIRKENHEAD both light cruisers, both being built in British yards in 1915 for the Greek Navy but then commandeered by the Royal Navy. The possibility of this being HMS CHESTER's sister ship, HMS BIRKENHEAD, is thought very unlikely as Burgess has painted many iconic actions of the First World War and CHESTER's action at Jutland, linked with the award of a posthumous VC to one of her young gunners, Boy Jack Cornwell, makes this an especially worthy subject for Burgess' brush. Cornwell's VC was widely celebrated across the country and both names were well known amongst all circles of society. It is therefore very reasonable to make the link that this is indeed HMS CHESTER in that action which won her and her young gunner undying fame. The story of CHESTER's battle is well known and needs only brief mention here. The Grand Fleet's battle cruisers with four battleships of the 5th Battle Squadron in close support, had charged off after units of the German High Seas Fleet who had drawn Beatty onto much heavier opposition. The battle cruisers were in trouble and the Commander-in-Chief, Admiral Jellicoe, some 40 miles north of Beatty was alarmed at the latter’s entanglements that were carrying him further and further from any support that the main Battle Fleet could give. Jellicoe therefore signalled the only other big gun squadron with the speed necessary to get to Beatty’s assistance, the 3rd Battle Cruiser Squadron which was ahead of Jellicoe and the main battle fleet (but still some 40-50 miles NE of Beatty), "To proceed immediately to support Battle Cruiser Force”. Rear Admiral Commanding 3rd BCS (Rear Admiral the Hon Horace Hood CB MVO DSO) with his flag in HMS INVINCIBLE (Captain A L Cay) and with HMS INDOMITABLE (Captain F W Kennedy) and HMS INFLEXIBLE (Captain E H F Heaton-Ellis MVO) in company and screened by 2 light cruisers (Captain Robert Lawson’s HMS CHESTER and Captain Percy Royd’s HMS CANTERBURY) and 4 destroyers, thereupon came round to the south west (where Hood judged Beatty to be) and worked up to their maximum of about 24 knots. This painting shows CHESTER in action at around 1745 on that evening of 31st May 1916. She is steaming on a north/north north easterly course (which would put a westering, but still highish, late May sun broad on her port quarter as shown here) and is being straddled by the guns of a light cruiser force commanded by Rear Admiral Friedrich which was similarly screening German battle cruisers. Raked by heavy fire at close range CHESTER's upper deck guns’ crews took a real hammering and Boy Seaman Cornwell, not yet 16 1/2 years old, though fatally wounded, remained at his post in the gun mounting attempting to carry out his orders: he was surrounded by the other members of the mounting all of whom were dead. His captain was vividly impressed at the bravery and stoicism of one of his young ratings and subsequently mentioned his name in a despatch to his superior, Beatty who, when in possession of all the facts was similarly so taken with the boy’s courage and bearing that he, too, forwarded Cornwell’s name up the line with a recommendation for the award of a posthumous VC (for despite being put ashore after the battle into the care of a local hospital, Cornwell had died of his wounds). Jellicoe concurred, very strongly endorsed the recommendation and passed the citation up to their Lordships. Arthur James Wetherall Burgess was born in New South Wales, Australia, in 1879 and after studying art in Sydney came to England in 1901. Three years later he was invited to exhibit at the Royal Academy and subsequently he became a member of the Royal Institute of Oil Painters and the Royal Institute of Painters in Watercolours and the Paris Salon. He illustrated for the Graphic, Illustrated London News, Sphere and the Australian Government too and was a founder member of the Society of Marine Artists and its Vice President. His works are to be found in the NMM Greenwich, the Royal Naval Museum Portsmouth and in many art galleries and museums in Australia and around the world.